Americans currently live in an age when food safety scares are headline news and an issue of concern for consumers. Take for example the ever-expanding peanut butter salmonella recall. While foodborne illness is a product of a long and complex food supply chain, its effects are often experienced in domestic environments of food consumption, such as the home kitchen. In fact, the evolution of the modern kitchen sits within a larger historical narrative of consumer food safety. Consider the home refrigerator, for example. Several scholars herald household refrigeration as one of the most important food safety achievements of the twentieth century (CDC 1999: 906; FPT 2011: 132; Roberts 2001: 29). Perhaps not coincidentally, the rise in home refrigerator ownership was coupled with, and fueled by, fervent consumer messaging from refrigerator marketers and home economics specialists alike. In his analysis, Peter Grahame argues that there is great variance among the content of refrigerator advertisements between the wars. He posits that recurring themes are limited to use of the terms “automatic” or “electric,” references to foods to be enjoyed, and mentions of scientific research (Grahame 1994: 293). He concludes that only Frigidaire’s advertisements significantly emphasized health as a recurring theme. 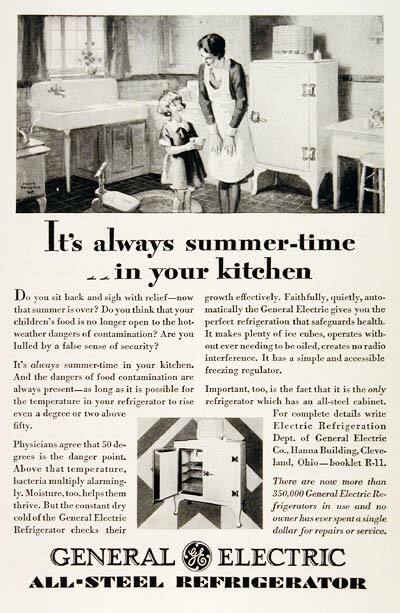 I argue, however, that consumer messaging in interwar refrigerator advertisements and home economics texts often emphasized food safety, frequently using fear-based tactics that targeted women. Furthermore, by placing refrigerator advertising within the larger historical context of the time, analyzing these messages also reveals larger themes within food safety discourse. First, it explores the duality in public perception of women as both “naturally” suited for domestic duties and mothering (including food safety) and inherently unknowledgeable in how to safeguard health. Secondly, it demonstrates how these messages capitalized upon public awareness of science and medicine, particularly infectious diseases, following the Golden Age of Microbiology. And finally, it shows how these messages reinforce the doctrine of personal responsibility for food safety. Domestic science resources and advertisements alike invoked maternal anxiety, which is clearly visible in a 1929 ad for a General Electric All-Steel Refrigerator. This advertisement maintains that it is a mother’s responsibility to invest in the power of the refrigerator in order to protect her child, invoking the personal responsibility for food safety, which falls on women. By mentioning 50° as a “safe” temperature, this advertisement also reinforces scientific knowledge of the day for fighting bacteria and disease. What will he be like when he grows up? Will he be tall and strong? Will he be – happy? So much of his future depends upon the food he eats. For, good food builds good health – and health is the foundation of a successful life. The advertisement argues that if a mother does not feed her children safe food, she will be personally responsible for their failure. Interestingly, this advertisement features a son, harkening back to centuries of pressure on women to not only birth sons, but also ensure that they grow into successful men. 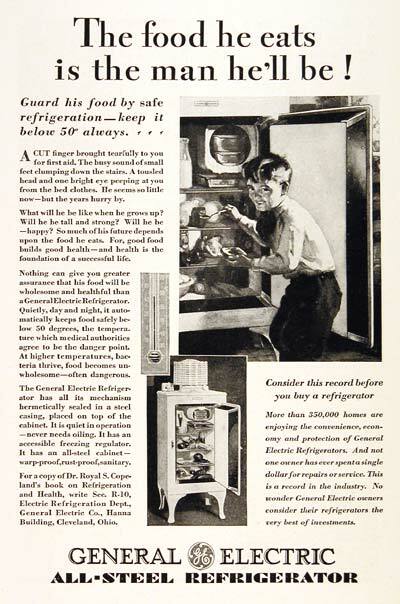 _______ General Electric Refrigerator Advertisement. “The food he eats is the man he’ll be!” 1929. Accessed April 15, 2012. _______ General Electric Refrigerator. 1929. “It’s Always Summer-time in Your Kitchen.” Accessed April 15, 2012. Centers for Disease Control and Prevention. 1999. “Achievements in Public Health, 1900-1999: Safe and Healthier Foods.” MMWR Weekly. 48, 40, October 15. (1999): 905-913. Accessed March 31, 2012. FPT Subcommittee of the 100−Year Planning Committee. “Celebrating 100 Years of IAFP, Journals: 1940s.” Food Protection Trends. (February 2011): 132. Grahame, Peter R. “Objects, texts, and practices: The refrigerator in consumer discourses between the wars,” in The Socialness of Things: Essays on the Socio-Semiotics of Objects, (ed.) Stephen Harold Riggin. (Berlin: Mouton de Gruyter, 1994). Roberts, Cynthia. “History of Food Safety” in Part 1: Overview of Food Safety, in The Food Safety Information Handbook. Westport: Oryx Press, 2001.